For quantitative determination of sucrose. • No interference by glucose. • Use 20 μL samples. Linear detection range: 17 to 2000 μM sucrose. Sucrose (C12H22O11) is a disaccharide of glucose and fructose with an α-1,2-glycosidic linkage. It is the most common food sweetener and the most important sugar in plants. 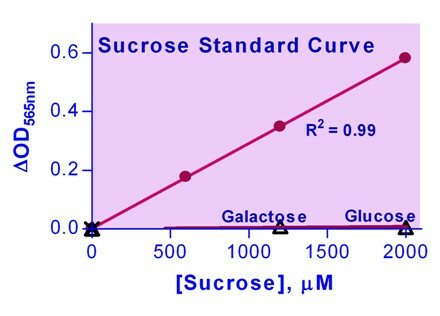 In mammals, sucrose is readily digested in the stomach into glucose and fructose, which are rapidly absorbed into the bloodstream in the small intestine. Simple, direct and high-throughput assays for measuring sucrose concentrations find wide applications. 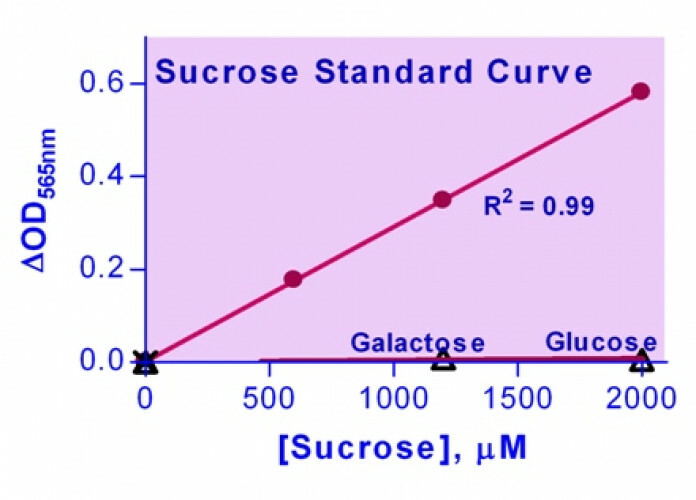 BioAssay Systems’ improved assay uses invertase to digest sucrose into fructose and glucose. The resulting fructose is then quantified using our fructose assay reagent. The measured color intensity at 565nm is directly proportional to the sucrose concentration in the sample. Applications For quantitative determination of sucrose.